Athletes are always looking for a competitive edge. Which is why people adopt alternative training methods that have nothing to do with the games they compete in. It’s not uncommon to hear about football players taking ballet to improve their agility and balance, or guys across a number of sports taking up mixed martial arts as a way to stay in shape, get stronger and develop physical toughness. However, martial arts training can also help athletes become better in their chosen sports. Studying taekwondo or karate requires both a mental and physical investment. Students need to develop mental focus to block out pain and still perform at a high level. The greatest martial arts master of all time is Bruce Lee. His mastery of several different disciplines allowed him to create his own: Jeet Kune Do. 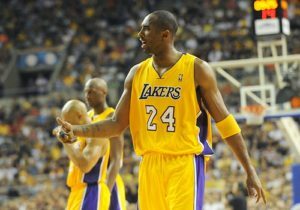 In the NBA, Kobe Bryant is one of basketball’s most famous and accomplished players. Bryant incorporated fundamentals of martial arts into his basketball training several years ago. In an interview with the Global Times cited by NBA fan blog The Basketball Jones, the Los Angeles Lakers superstar revealed how Bruce Lee influenced his training regimen. “It seems Bruce Lee has nothing to do with basketball. To me it has everything to do with basketball. There are a lot of similarities,” Bryant told the Times while touting Lee’s philosophy of engaging in combat without being rigid in the approach to battle. Basketball trainer Ganon Baker wrote that Jeet Kune Do focuses on how to react quickly and efficiently while exerting minimal physical energy. This may seem oxymoronic because sports are primarily about physical exertion. But by understanding how to not waste energy unnecessarily, athletes will essentially become better at the games they play. One of the primary selling points for martial arts schools is how the training they provide helps people. This information should be communicated to those expressing an interest in martial arts, as it could keep them motivated enough to complete their training and master the discipline. Running a martial arts school isn’t easy. However, by reminding people of the ways in which self-defense classes can greatly enrich their lives beyond simply winning a fight, owners can benefit.